A state of physical ease and freedom from pain or constraint. The easing or alleviation of a person’s feelings of grief or distress. Rochester, New York, on the south shore of Lake Ontario is infamous for frigid cold and snow-packed winters. Back in the day, I was a newlywed just back from two years of contract flying in North Africa—freshly relocated from our hometown of Washington, D.C., to KROC, where I had landed a job flying/marketing for a Beechcraft Dealer. Comfortable. Having graduated from Syracuse University, my (now “ex”) wife knew what we were getting into (discomfort), so, as a condition of taking the job, I had to promise to bring her home to D.C. whenever she had had enough of upstate New York, weather wise or otherwise. Comfort. It was an easy deal to make. Interest rates were at 14 percent, the ramp was full of unsold airplanes that had to be exercised, I was addicted to flying (especially new Barons, Bonanzas and King Airs), and I needed Instrument time after two years of perpetual equatorial sunshine. We moved in the spring. We had no pets and no kids. At least once, often two or three times each month, we would hop in an airplane and fly straight down to Dulles to spend the weekend in D.C. Easy. Then it was early December. Same trip, same route. Different weather. ROC was 200 and a half in blowing snow. It was frigid. But IAD was cold, clear and a million. I was more worried about hitting my wake from the previous Thanksgiving trip than I was about the weather on this one. We planned to be airborne by 7 p.m. Another routine quick hop; comfortable—nonchalant. The only plane available was a Duchess. No boots, bare props but no worries—it had a Janitrol gas heater to keep us warm, and outside it was too cold for ice. We broke ground at 7:15 p.m. I raised the gear as we went solid IFR, stabilized the climb and contacted Center. 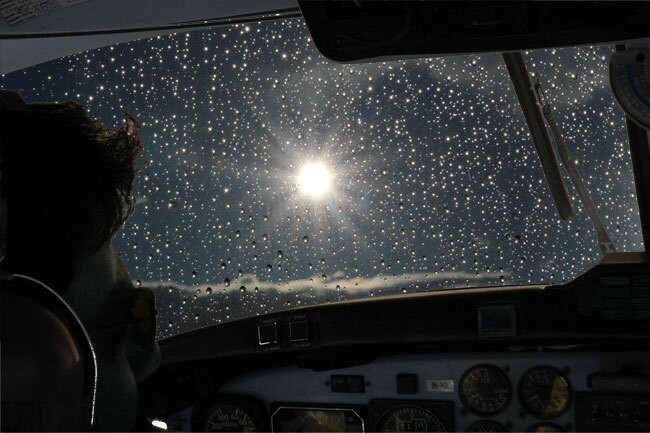 Just as we got “cleared on course, climb and maintain…,” we broke out on top and the heater quit. The sky was a sea of stars on an inky black canvas all the way to Dulles. We had about 1:40 to go. No sweat. Resetting the heater would require turning back, an approach to minimums in blowing snow, landing, opening the nose baggage, resetting the heater circuit breaker, a delay and no guarantee the breaker wouldn’t pop again. Comfort waning, I was feeling slight distress. We pressed on. After all, just a short flight. One hour later, overflying University City, Pennsylvania, I thought of landing to warm up. I had given my coat to my wife. It was frigid in the airplane. I was not in a state of physical ease, free from pain and constraint. I was shivering all over. Constrained by my decision to overfly University City, my discomfort blossomed to encompass both physical and emotional distress. Far from the relief one might expect, initial contact with Dulles Approach Control energized the same circuit that controls one’s bladder when, during urgent need, the pressure builds exponentially with each step closer to the restroom. Very uncomfortable. Dulles was slow; the vectors to final were way too languid. My legs were numb. I was really shaking all over. For someone experiencing creeping full-body numbness, I was profoundly uncomfortable. I requested a visual and flew an Ag pilot approach to RWY01R. I felt vaguely disengaged—I remember double-checking the gear was down because of this hazy mindedness. By the time we made the FBO ramp, Stubby, one of the regular linemen, literally had to pull me out of the plane. Walking into the terminal was like walking on fire as my feet and legs began warming up. In recalling this episode, I am comfortable about one thing—no flight is ever routine, and too much comfort is very uncomfortable. Lou Churchville is a commercial pilot, writer and marketing communications professional. He holds single- and multi-engine land, instrument, glider and Certified Flight Instructor ratings. Want more pilot perspectives? Check out our Contrails archive.